I pride myself on my love of nature and self-taught knowledge of nature and animals. My parents sought to give my siblings and I many richly educational, wonderful adventures as we traveled to Mexico, the World’s Fair, Expo 67, in Montreal, the mountains, beaches, zoos, and camping in our travel trailer, and later a mobile home. l loved traveling, seeing nature first hand, and reading books about life on our planet. I read all of the James Herriot books about the Scottish vet who started his practice in the 1930’s. Researching information about birds, cats, animals, trees, flowers, even insects, is one favorite hobby of mine. Most any life form is interesting to me. So I wanted to give my first-born plenty of information and experiences to whet his hunger for knowledge about plant and animal life. But my personal efforts to provide these wonderful experiences with nature backfired on multiple occasions. While still a young child at 3 or 4 years of age, my son, Son, and I would go to the neighbor’s house to pet Smokey. Smokey was a big, sweet, St. Bernard. He was chained to his owner’s garage and responded excitedly to the petting and attention we gave him. He was fond of us, I believe. So fond of us that when he broke his collar and got loose one day and came bounding over to Son and I in our open back yard. His greeting was not the most happy for Son. Smokey, in his exuberance knocked Son down, and stood over him slobbering and licking the poor kid. As you may guess this was a traumatizing experience for a little kid half the size of the dog! So with time and healing I made up imaginary stories about how Son was rescued many years ago when he was trapped in the snow and how Smokey came to rescue him. I tried to help overcome the terror he had for dogs in general after that one experience. Finally years later we moved and there was a border collie and another small dog who were quite non-threatening. Son found them funny and sweet and seemed at last to put his fear of dogs aside. 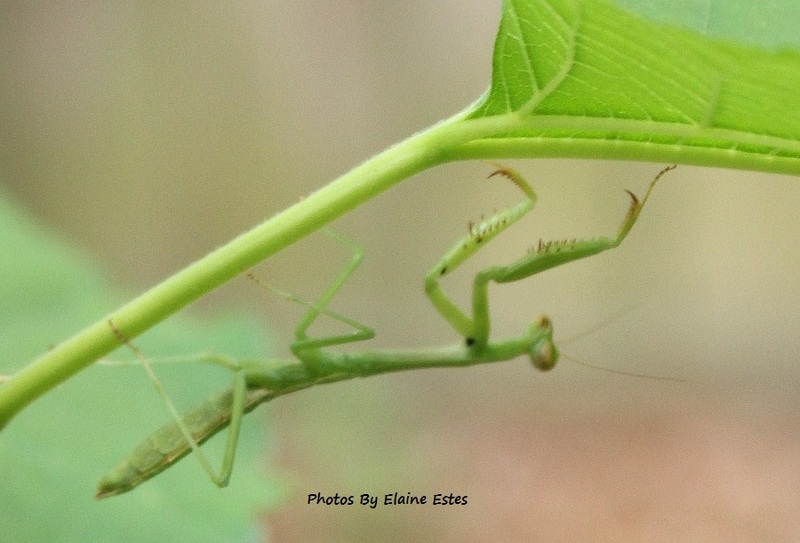 Living in the country when Son was still small, 3-5 years old, we were in our wonderful big back yard and I spied a praying mantis on a leaf at a level where Son could see it. We stood there looking at the large, green, stick-like insect in as much wonder as it seemed to be staring at us, cocking its little head one way and then another. Suddenly its wings opened and it flew straight at us! I didn’t know they could fly!! We both backed away, rather shaken up at such aggressive behavior when we hadn’t done anything but observe it! Surely a June bug is safe. Then there was the little green June bug. Harmless, right? This of all the bugs out there could not hurt my three year old son or scare him. Wrong! I picked up one and placed it in the palm of his hand. We were amazed at how its little feet tickled his hand. Then it climbed up on a finger and clamped its prickly feet around Son’s little finger, and held on for dear life! I afterwards wondered if it were mating season for the June bugs and it thought it had a female in its grasp. Needless to say we were both relieved when I freed his finger from those prickly little feet. We went to a nice little petting zoo a few miles from our home. There within a high fence was a rhea, kind of like an ostrich. There were several children holding up little cups of dried corn kernels for the rhea to eat. I watched for a while, being sure there was no harm in this creature. After all several other children had fed the rhea without incident. I asked Son if he wanted to feed the rhea and he agreed after seeing how harmless the whole venture would be. As he held up his cup of kernels the rhea cocked its head to one side and eyed Son’s hand and nipped one of his fingers! I guess the rhea was tired of the corn and wanted what looked like a worm. Why did that stupid rhea do that to my little boy and not some other person’s child!!?? Well, we washed his finger, bandaged it and went on. Now that my son is 6’6″ he is not afraid of dogs. He actually wants a big Pyrenees dog someday. These are huge white dogs. (Hmm, maybe I didn’t fail him too much.) He likes cats too. He is by no means a naturalist or insect lover, but respects the lives of critters around him if they are harmless. I am sure that he doesn’t try to hold June bugs or feed rheas any more. But who does anyway. A Black Cat With Personality! I think the praying mantis is one of the most exotic and interesting creatures. Love their triangular eyes. I too find them fascinating! Insects are as a whole amazing survival group! Lovely post. Don’t see many St Bernard dogs around here. Can see how they could leave a huge impression on a small child. Who has grown up to want a Great Pyrenees! I found a mantis egg casing just the other day on a rose bush. First I have seen in so many years, and brought back memories of ‘gathering’ them as a child to be placed in our garden. Thank you. All my best to you. Thank you, JoHanna. Delighted that you enjoyed this post. I haven’t seen any St. Bernards either in years! I didn’t realize it until you said that. Hmm. I guess different breeds get popular and others become less so. They do like cold weather though, maybe that is part of the problem. Mantises are so cute but deadly. I saw a video of one stabbing its pretty and eating it a piece at a time.The poor makes have to decide between living and mating, since the females eat their heads first after mating!! Freaky little bug! So glad I brought back memories for you. Hugs!! And best wishes for you too! !